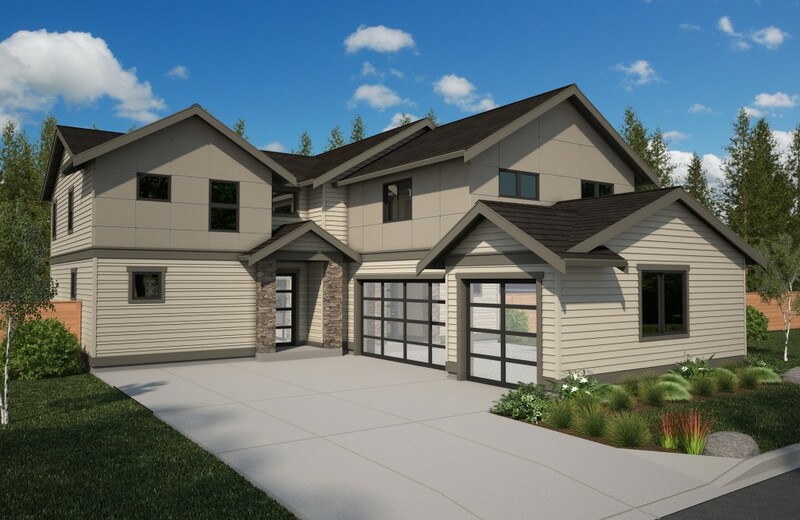 The Rainer greets you with soaring ceilings leading into the open main floor with strategically placed windows allowing natural light to fill this warm space. Just off the great room is the dining area that flows into the gourmet kitchen with large island and walk in pantry. Huntwood custom cabinets, Italian Bertazzoni range with Bertazzoni hood vent, quartz countertops with full height subway tile backsplash, mosaic tile accent and a stainless undermount sink complete this chef’s dream. Relax after a long day on the covered outdoor patio conveniently located off the dining and kitchen area. A den/guestroom, three quarter bath with walk in closet, and mudroom complete the main floor. Upstairs, the master suite features an elegant 5-piece bath with quartz counters, ceramic undermount sinks, spa soaking tub, tiled surround shower, tile flooring and a generous walk-in closet. Two additional bedrooms, full bath, and an oversized leisure loft provide space for everyone. The designer utility room with upper/ base cabinet and sink in addition to a three-car garage adds luxury and convenience to this handcrafted home.